A couple of quiet weeks for us, so you may have noticed the distinct absence of a blog last week. In the afternoon, we cleaned all the windows inside and out (always a very satisfying task although one we seem to have to do with reasonable regularity, perched as high as we are in a coastal city!). Then Mark tried out the new electric lawnmower bought that morning to mow our grass for the first time, quite the thrill! Then we took a quick trip to the garden centre to buy some winter seeds, peas, broccoli and leek(but we are still yet to plant as we subsequently realised we have no seed trays). Sunday, Mark and I were like ships passing in the night. I went to church while the they took a walk to the ducks and park. I arrived home in time to put Noah down for a nap whilst Mark immediately dashed out to Dry Creek in the Hutt for a mountain bike ride. I then was out in the evening for a meal out with my antenatal friends, we don't get together very often but when we do it's always nice to hear what the other kids Noah's age are getting up to! We even managed to plan ahead and find a weekend in August that everyone can attend to have a combined third birthday party for the kids! This week we put our old Phil and Teds stroller on Trade Me, as we have had a kind offer from a friend who works at Phil and Teds to help us get a new one at a very decent discount. After putting it on for $150 reserve (and would have been very happy to get this), we were pretty astonished and amazed when it sold for......$425! Along with a few other things that we managed to sell this weekn too, it means our new stroller will cost us nothing! 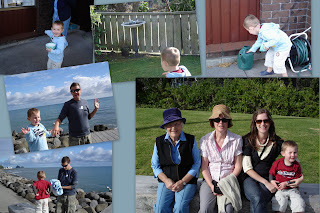 As today is Anzac Day in NZ and no shops were open till after 1pm, Mark managed to get the supermarket shopping done yesterday, which left this morning free for us to get out and about. We decided to take a drive up to the wind turbine and walk the 3km ridge to the radar station (aka 'the golf ball') as we were also interested to see how many of the new Makara wind turbines we could see. It was a very still morning (very un-Wellington like! ), and it made for a lovely walk. Mark did well with the extra 15kg on his back across the 6km which is fairly hilly in both directions, and we were MORE than ready for coffees and fluffy when we got home. We made some savoury muffins for lunch which was timed to perfection as we got a call from my cousins Gwyl and Beth, who came and joined us for lunch. Bethany is down in Wellington at uni now and living not too far away in the suburb of Mt Cook with her partner Aaron, whilst Gwyl is about to return to the UK to his girlfriend Laura, and to work and then study later this year. It was great to see them, it had been at least a year since we had seen Beth. Today Mark came down with the daycare bug that has been going round and was suffering from stomach cramps and frequent trips to the toilet. Noah and I tried to keep out of his way for the whole day, and it turned out to be fortuitous that I had planned the daycare catch up at the pool. 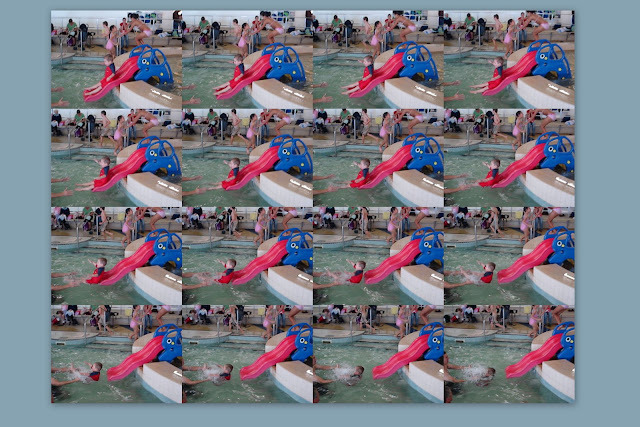 It is actually a very good facility, with a great sized toddler pool complete with waves from time to time, although the waves were a lot more gentle than the pool at New Plymouth. Noah really enjoyed the lazy river which had blue underwater lights, lots of bubbles and a spa like feature. It was really easy to spend an hour and a half in the pool with so much going on, and even better that as it was a very miserable day outside (the first weekend day in a long time that has been like it) it turned out to be a perfect way to spend the afternoon. Noah enjoyed hanging out with his daycare buddies, but we didn't manage to get on the hydroslide (as didn't think it would be very wise for me to take him in my current state), so it'll be a good excuse for a trip back there so Mark can take him on it. Noah has also nearly fully transitioned to the 'Over Threes' side of daycare. He even had breakfast there on Friday, and has been there every day this week when we've been to pick him up. He is loving being back amongst his great pals again most of whom are 6-9 months older than him, so he has been more than ready for the move for a while. Although they usually wait till the children are nearer three to transition, it is great that they recognise that some children are ready earlier than others, and Noah seems very contented to be with all the older children, and they all take such good care of him it is lovely to see! Aah, the end of a very enjoyable Easter long weekend. It started bright and early on Good Friday with our birthdays. We enjoyed several webcams with various family throughout the day, hot cross buns and coffee with Jared, then Jackie arrived bearing Guitar Hero on the Wii for our birthday gift. Noah and I also had our first ever experience of Mario Kart on the Wii, which was hilarious to say the least. Noah kept up a running commentary as we hooned around several different courses, 'ooh watch out Mummy, don't hit the cow', 'weee............through the tunnel', 'oooh Mummy look out we're going to land in the water'. Very funny, and he would have played it much longer given half the chance. After a nap, we (including Jackie) headed to the zoo. We continue to stand by our theory that the best time to visit the zoo is late afternoon, as we were thrilled to see so many of the animals out and about. We had an amazing encounter with the tigers who were right up at the fence and prowling backwards and forwards in front of us. We can go the zoo time after time and not see them as they're pretty good at keeping hidden away, so it was a real treat. The chimps were also outside monkeying around and making lots of noise, which was entertaining. Then it was home for fish n chips and burgers for dinner, and some more Guitar Hero and sports games on the Wii. Saturday was our big day out at the wedding in Masterton, and it sounds like a great afternoon was had by Jackie and Noah at the park and indulging in takeaway pizza for dinner. The weather in Masterton was gorgeous and we also took the opportunity to pop in on Sarah and Paul to meet the latest addition to the family, Thomas who is now 5 weeks old. The story behind the how the bride and groom met at the wedding we went to is rather unique and deserves to be retold. Meredith (who used to work with Mark) embarked on a fundraiser for child cancer (CureKids) which involved racing from Auckland to Queenstown any way possible on only $10. After making it across the Cook Strait, Meredith (and her friend Lucy) managed to con a truck driver to let them hitch a ride in his cab (even though it was against company policy) to Christchurch. Well the rest as they say is history, even though it did take Scott a few months to tell his parents (the owners of the transport firm) about how he and Meredith met. It certainly made for some highly entertaining moments during the evening's speeches, and seeing the bridal party arrive at the reception in the cabs of 3 big Vowles Transport trucks with horns blaring was very unique too. I found it very hard to stay awake and drive the 1.5 hour drive home but found blasting the air conditioning at my forehead the most effective way to keep sleep at bay. Sunday morning, Noah (dressed appropriately as a pirate looking for treasure) enjoyed an Easter egg hunt around the garden, and then all of us (Jackie too) headed to church for the Easter Sunday service, before enjoying more hot cross buns and coffee together. Later in the afternoon, Mark and Noah headed to the pool for a swim whilst Jackie and I took the opportunity for a nice long walk to work off at least some of the excesses of Easter. 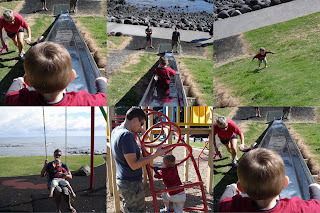 This morning, we headed down to the ducks and play park at the gardens, before pumpkin soup for lunch and a drive out to Pukerua Bay to drop Jackie home. It has been so heavenly to have a long weekend here at home just relaxing all together, and weekends like this aren't that common in our household so that made it all the more special. The other news in my world which I can at least talk about openly now is the potential sale of M-co (the company I work for) to NZX. The news was announced publicly on Tuesday, and all the due diligence and preparation work has been taking up a fair bit of my time over the past few weeks, and being part of the integration team working towards aligning the two companies is bound to keep me busy for the next few weeks and months at this rate. The feeling is pretty positive around M-co so far, but there is much work to be done to ensure it remains that way through the next unsettling period of change. I guess by now I should be used to change at M-co, things are always changing, it has only been 18 months since the managers bought out the company, and my team has always been changing around me (generally getting smaller and smaller till now it's just me). So I have to also embrace this as a new opportunity and remain hopeful that the end result will provide new growth and development opportunities for me as well as for the company. I am also rather thankful to be in full health again to have been able to enjoy the Easter break, after a nasty couple of days with a tummy bug last week. I couldn't take any time off work due to all that was going on with the sale, plus I was suddenly short staffed and had to cover for my student unexpectedly taking time off Tummy bugs wait for no man when the monthly payroll needs to be processed and paid!It was a little worrying as I had a couple of days of stomach cramps, which resulted in a trip to the after hours doctor and getting a blood test as a precaution (thankfully this came back clear of all the nasty infections you wouldn't want in pregnancy). After spending most of Wednesday night up and down to the toilet (that's more than enough detail I think! ), I felt much better on Thursday. Thank you to all those who I know were praying, and to Jesus for your protection over me and this little life that is inside. I hope that where ever you, your family and friends were this Easter, you were all able to celebrate and remember the real reason for Easter. As much as it is lovely to indulge in the fun of Easter egg hunts for the children and copious hot cross buns (my vice! ), we also should never forget that the reason we celebrate is because 2000 years ago, Jesus did what no other man before or after him has been able to do, taking the sins of the world to the Cross, and laying them to rest, so that we might all be reconciled with God, and able to enjoy a real and personal relationship with Him if we choose. We've gone a little more upmarket on the photos for this blog - slideshow instead! Credit to Sarah Lee of chezlee.co.nz for the great idea!